Bovey Manor is representative of a GWR Branch line terminus. 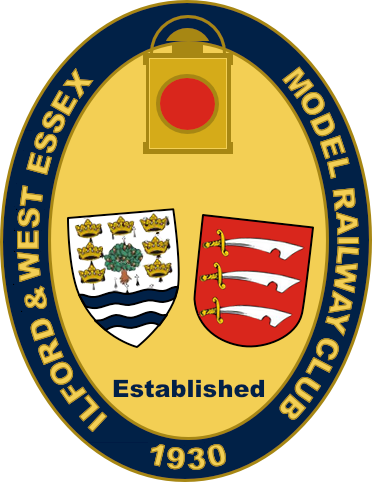 This layout started life as purely a test bed for Don Neighbour (fellow member and former president of the I & WEMRC) to test his loco building skills. Significantly also his track laying skills. The layout is just 17 feet long in total. As we were asked the question, it is also 22½ inches wide. No idea why. (Probably the garden shed dimensions.) 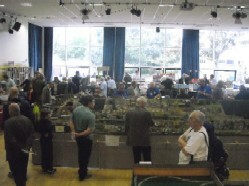 It has also notably been shown at the Gauge 0 Guild spring show at Kettering. Track and point work are hand-built using C & L track parts. Buildings are scratch-built using plasticard, the station is based on Watlington, the engine shed based on Tetbury and the goods shed and signal box from Lambourne. 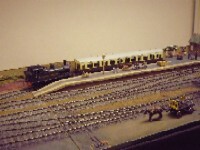 Locomotives used on the layout are a mixture of kit- and scratch-built, and rolling stock is all from kits.